Trego’s next door neighbor, Elizabeth “Bessie” Pickering, posed for this work holding the infant Robert Hooley, son of Mr. and Mrs. Benjamin Hooley of North Wales. 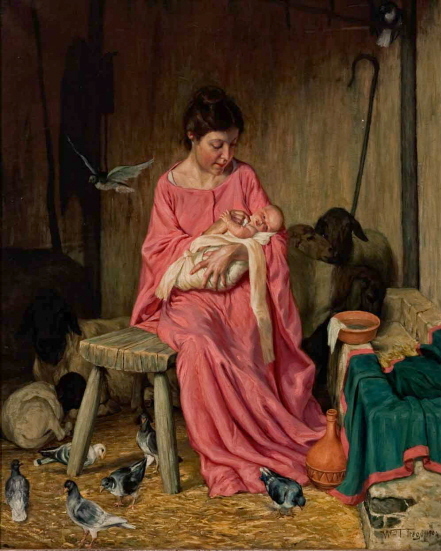 Begun in 1903, this was the first of several versions of this subject Trego did in the last years of his life and the only one of his several religious paintings which can be located today. Compared to some of Trego’s other late paintings, which bear evidence of a disinterested artist, this work demonstrates a keen interest in both the subject matter and the details of the scene. Several passages in this painting are arguably some of the finest Trego ever achieved, among them the wonderful look on the baby’s face, the photographic realism of the terra cotta vessels and the convincing appearance of the water in the bowl. The high quality of this work makes it all the more unfortunate that Trego’s other religious paintings have not been located. Obtained from the artist by a daughter of his cousin, Howard Trego, it has been passed down through her family to the current owner. The painting is in excellent condition, having been cleaned before its appearance in the “Three Artists Named Trego” exhibit in 1992.